Lately lots of hotels in the Downtown Eastside have been sold or are up for sale. The photo shows a for sale add for the Laurel Hotel which has 52 units housing low-income people. When buildings are sold it often means that the new owner wants to upgrade the hotel and then charge really high rents, like $900 or $1000 a month, even $1500 a month for a hotel room with a bathroom down the hall. BC’s rent control law says that if a tenant stays in his room or apartment rent can only go up 2% plus inflation each year. But if the tenant moves, the landlord can raise the rent as much as he/she likes. Are people being harassed so they will leave voluntarily? Are people being evicted? Sometimes the evictions are illegal and you can fight them. Is the landlord offering people money to leave? If people are being evicted they can go to advocates at First United Church for help in fighting the eviction. If a landlord is offering you money, DON’T TAKE IT RIGHT AWAY. It’s a really good idea to figure out if there is a place where you could move to that you can afford. Mostly there aren’t any good cheap places left. Also, it’s a really good idea to try to meet with all the tenants who are being affected. That way you can plot what to do together and you will be much stronger in securing your tenancy rights. YOU CAN SAVE YOUR HOUSING IF YOU KNOW YOUR RIGHTS! The city has an SRA bylaw that says if a landlord wants to renovate a room and that you have to move in order for him to do it, the City can make the landlord sign a housing agreement that would pay your moving expenses, guarantee you a room in the renovated place at your old rent, and get your moving expenses paid to move back. So it’s way cheaper for a landlord to pay a tenant $2000 or $3000 to leave than to get hit with the City’s housing agreement. If you know these things you have POWER. Some hotels that have been sold recently or are up for sale include the Harbour Rooms, Shamrock, Centennial, Summer, Laurel Apts (shown in photo), Georgia Manor, and 666 Alexander. 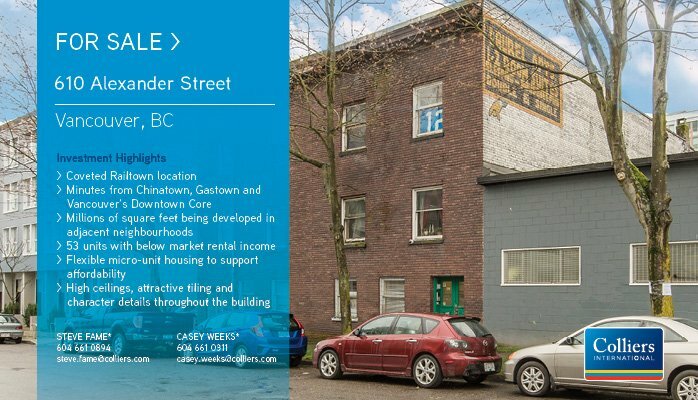 If you’re a low income person living in any of those hotels, watch for signs that the landlord is trying to get rid of people on welfare or disability and call the Carnegie Community Action Project at 604 729 2380. CCAP has also heard the low income people at the Metropole and Lotus are being offered money to leave ($1000 at the Metropole and $2500 at the Lotus). If this is happening to you, please call CCAP. We can help you get together with other tenants and fight back to keep your room or at least get more money.